a) Failing to provide complete personal information, supporting documents, and/or attend interviews (if required) with the Royal Canadian Mounted Police or the Canadian Security Intelligence Service will render an applicant ineligible. c) In the case of pending criminal charges (which would render the applicant ineligible if a conviction resulted) and any outstanding criminal warrants relating to such offenses, an applicant will be ineligible until a court decision is made on the charge(s)/warrant(s) or the warrant(s) have expired. d) Violations of program legislation (such as legislation and regulations administered or enforced by CBSA) can result in ineligibility. For example, multiple minor seizures would result in a ten-year ban and any contraventions in relation to the border enforcement priorities listed above would result in a lifetime ban. e) National security concerns may render a person ineligible if there are sufficient grounds to suspect that the person constitutes a threat to the security of Canada as defined in Section 2 of the Canadian Security Intelligence Service Act. f) Other security threats such as war crimes, crimes against humanity, and transnational crime such as trafficking of persons/human smuggling, money laundering, or terrorism financing are also grounds to deny, cancel or suspend an authorization. g) The Immigration and Refugee Protection Act (“IRPA”) currently authorizes the Minister of Immigration, Refugees and Citizenship Canada (“IRCC”) to declare a foreign national ineligible (who is otherwise admissible) to enter Canada for a period of up to three years based on public policy considerations, as outlined in Subsection 22.1(1). CBSA’s proposal will also make such persons ineligible for TTPs. h) Where a person is required (i.e. 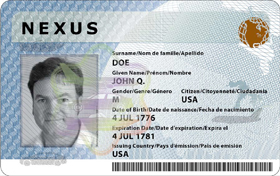 by court order) to surrender their travel documents (such as a passport under the Family Orders and Agreements Enforcement Assistance Act), this person will also become ineligible for a NEXUS or FAST authorization (or their existing authorization may be suspended). d) If the person is a family member of a person who is serving at a Canadian or American diplomatic mission or consular post in a foreign country, that foreign country. b) Only goods imported by pre-approved companies and carriers authorized under the Customs Self-Assessment program are allowed in the trailer of a commercial highway conveyance. a) No longer meeting any of the listed eligibility criteria may lead to membership cancellation. b) Pending criminal charges, outstanding criminal warrants, or court orders to surrender travel documents would lead to a suspension but not a cancellation. A single lack of compliance with a program condition could result in membership suspension for one year. c) Repeated lack of compliance with program conditions within a twelve-month period could result in membership cancellation and a period of ineligibility for six years.